When I started posting jokes for kids, I had no idea what an impact they would have. There are a lot of reasons you might be looking for some good kids jokes. Over the years I have heard from so many parents (and grandparents) who have found great uses for these printable jokes! Perhaps you are trying to connect with a long distance Grandchild or maybe you have a little one who uses them to start conversations with new friends. Maybe you add them to lunch boxes or keep them handy to reconnect after a meltdown. Whatever you plan to use them for, this post has jokes for every occasion… enjoy! There is no better way to celebrate the change of seasons than with some giggles. 6 jokes perfect for Winter. What do you call a slow skier? – A SLOPEpoke! Which two letters of the alphabet do snowmen prefer? – I.C. Who are Frosty’s parents? – Mom and Pop-Sicle. What do you call a penguin that steals baby octopuses? – A SQUIDnapper. You will find all 20 Winter Day Jokes + printable page here. 6 jokes perfect for Spring. What type of bird should you never take to the bank? – A Robin. Why are people always tired in April? – Because they just finished a March. What creature is smarter than a talking parrot? – A spelling bee. What goes up when the rain comes down? – An umbrella. Why couldn’t the flower ride its bike? – It lost its petals. What has 18 legs and catches flies? – A baseball team. You will find all 15 Spring Jokes + the printable page here. 6 jokes perfect for Summer. What do you call a fish with no eyes? – A fsh. Which letter is the coolest? – Iced t.
Why do bananas use sunscreen? – Because they peel. What do sheep do on sunny days? – Have a baa-baa-cue. You will find all 18 Summer Jokes + the printable page here. 6 jokes perfect for Fall. What do you get when you drop a pumpkin? — Squash. Why did Humpty Dumpty have a great fall? — To make up for his miserable summer. What is a tree’s least favorite month? — Sep-Timber! How do trees get onto the internet? — Easy, they just LOG on. Why did the scarecrow win a medal? — He was outstanding in his field. What kind of coat goes on wet? — A coat of paint. You will find all 18 Fall Jokes + the printable page here. From Valentines Day Cards with jokes to passing out a joke with each piece of Halloween candy, jokes can add a little something special to every holiday. 6 jokes perfect for Valentines Day. What did the boy octopus say to the girl octopus? — Can I hold your hand, hand, hand, hand, hand, hand, hand, hand? What is a vampire’s sweetheart called? — His ghoul-friend. What did the Valentine’s Day card say to the stamp? — Stick with me and you’ll go places. What do you call a very small valentine? — A valentiny! What do you call two birds in love? — Tweethearts! What do farmers give their wives on Valentine’s Day? — Hogs and kisses! You will find all 12 Valentine’s Day Jokes + printable joke cards here. 6 jokes perfect for Earth Day. Why do tornadoes zigzag? — They’re dizzy. What did the tree wear to the pool party? — Swimming trunks. What’s the biggest moth in the world? — A mammoth! Why did the woman go outdoors with her purse open? — Because she expected some change in the weather. Why is grass so dangerous? — Because it’s full of blades. Why did the leaf go to the doctor? — It was feeling green. You will find all 18 Earth Day Jokes + the printable page here. 6 jokes perfect for Halloween. You will find all 23 Halloween Jokes + the printable page here. 6 jokes perfect for Christmas. Why do Mummies like Christmas so much? — Because of all the wrapping. What does one snowman say to the other? — Do you smell carrots? Why did Santa get a ticket on Christmas Eve? — He left his sleigh in a snow parking zone. What does Mrs. Claus say to Santa when she sees clouds? — Looks like rain, dear. What kind of ball doesn’t bounce? — A snowball. 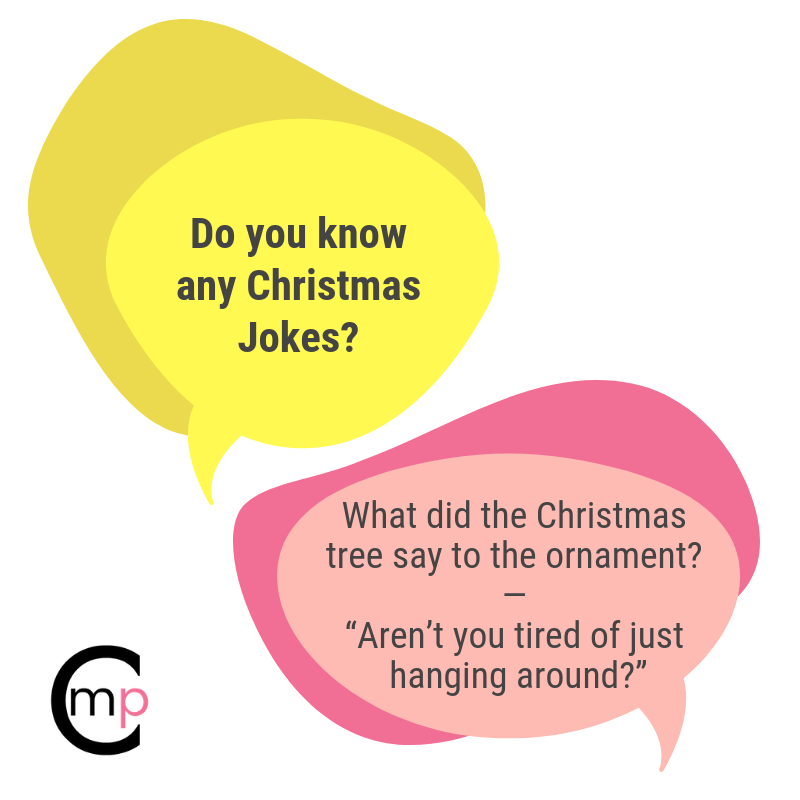 You will find all 25 Christmas Jokes + the printable page here. Sometimes a laugh is the only support our little ones need when something gets a little tough. 6 jokes perfect for Math. Why didn’t the two 4’s want any dinner? – They already 8! 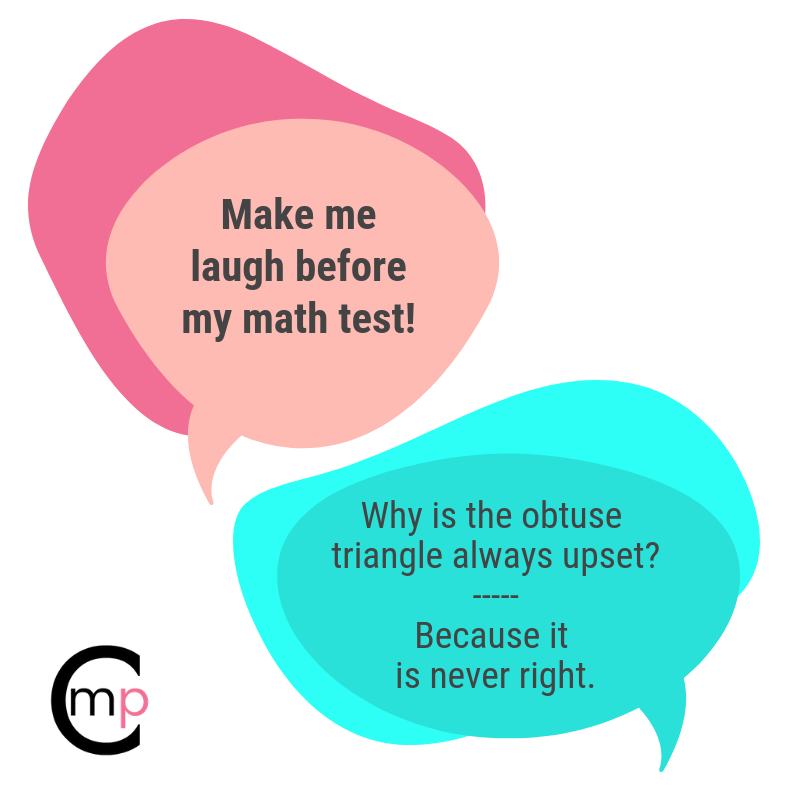 You will find all 18 Math Jokes + printable page here. You will find all 15 School Jokes + the printable page here. 6 jokes perfect Lunch jokes. What kind of nuts always seems to have a cold? – Cashews. Why did the fisherman put peanut butter into the sea? – To go with the jellyfish. What is a vampire’s favorite fruit? – A neck-tarine. Why did the orange stop halfway through the race? – He ran out of juice. What do you call cheese that’s not yours? – Nacho Cheese. Why aren’t banana’s ever lonely? – They hang out in bunches. You will find all 20 Lunch Jokes + the printable page here. Being the “Fun Mom” doesn’t always come naturally to me. These jokes have helped make connecting in a fun way a little easier. Knock, knock. Who’s there? Figs. Figs who? Figs the doorbell, it’s broken! Knock, knock. Who’s there? Double. Double who? W! 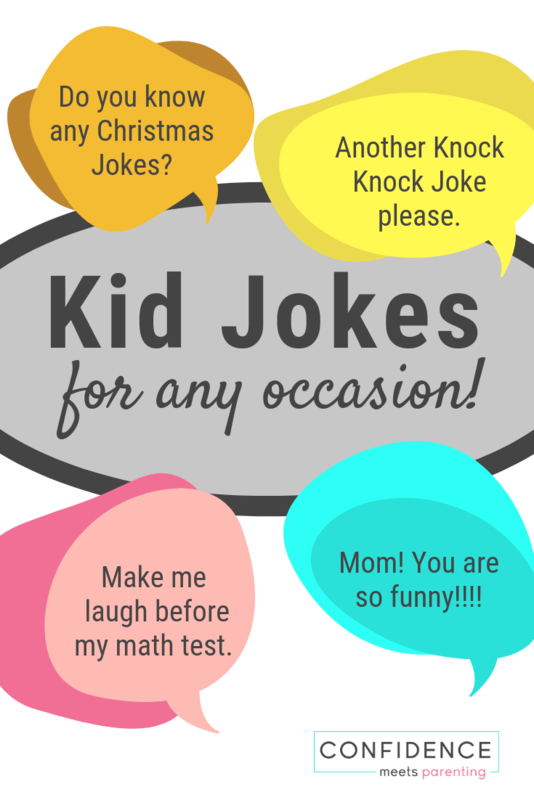 You will find all 20 Knock Knock Jokes + printable page here. 6 tooth jokes that are perfect for a trip to the Dentist. What does a dentist do on a roller coaster? – He braces himself. Why did the tree go to the dentist? – To get a root canal. What time do you go to the dentist? – Tooth-Hurty! What did the werewolf eat after he had his tooth fixed? – The dentist. Why didn’t the monster use toothpaste? – Because he said his teeth weren’t loose. You will find all 15 Tooth Jokes + the printable page here. 6 super silly kid jokes. Why did the cookie go to the doctor? — Because he was feeling crumby. What do you call an alligator in a vest? — An investogator. Why was 10 scared? — Because 7 ate 9. What do you call a sleeping T-Rex? — A dinosnore! How do you make a tissue dance? — Put a little boogie in it. What do you call a flying skunk? — A smelly – copter! You will find all 18 Super Silly Jokes + the printable page here. You just might want to pin these 84 Good Kids Jokes for Any Occasion for later!